O’Neills have supplied fellow Super League team Widnes for six seasons now, but signing up St Helens is a real coup for the GAA specialists – along with the myriad lower tier clubs, O’Neills can now be said to have a significant presence in the top flight of both rugby codes, and on evidence here, that’s no bad thing. The home shirt is a really nice blend of the traditional and classic. 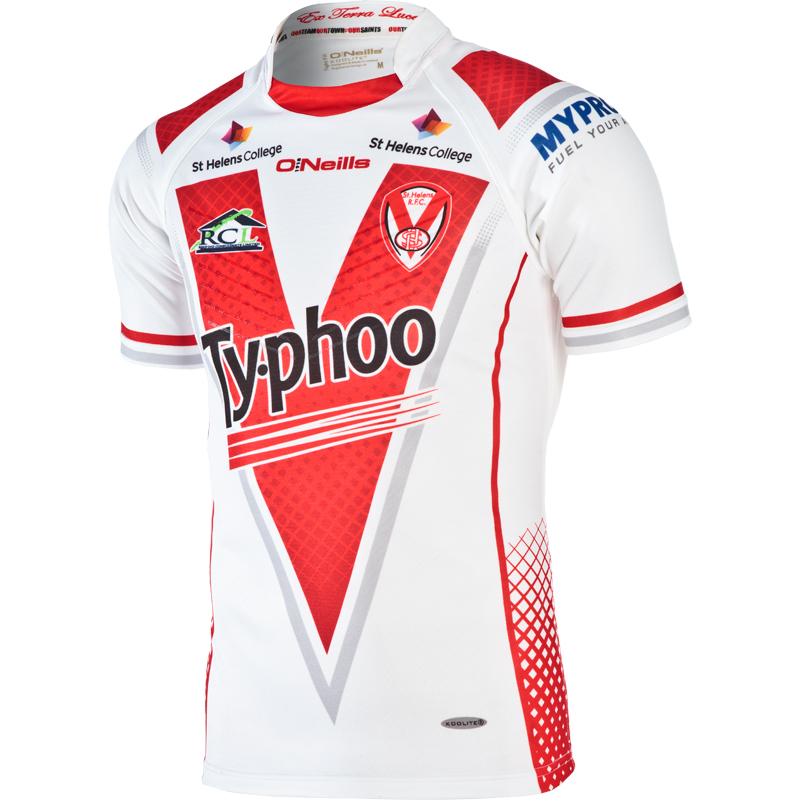 After a few years of slightly stubby chevrons on ISC-made St Helens shirts, this one is a proper, deep, bold V, in the classic Saints style. In fact, it’s probably the deepest V we’ve seen on a Saints shirt since Puma’s 2008 effort, and that one looked a bit wrong, let’s face it. It’s the classic V style then, but that doesn’t make this shirt a slavish retro design, as there’s plenty more going on here. Unusually, there’s a cross-hatched pattern across the V, which is echoed in red on the side panels of the shirt, and there’s also a light grey outline to the V itself. These are small details, so small that we should probably be locked away for even caring, but we think it elevates the shirt from ‘old school’ pastiche to something that melds iconic, classic design hallmarks with some modern flourishes to create a properly nice contemporary shirt. The alternate jersey is a much more overtly modern affair. 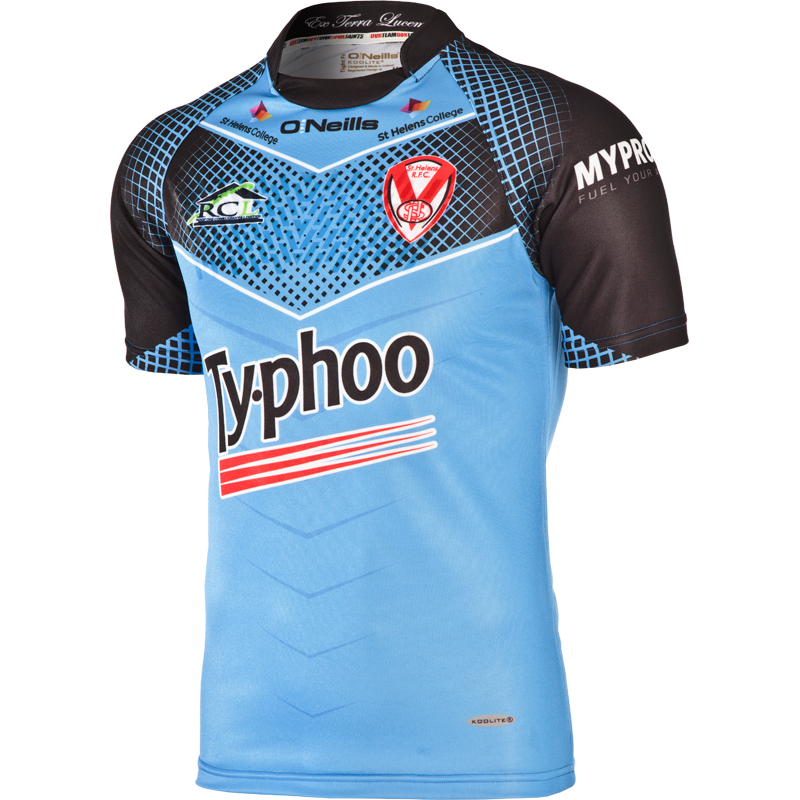 Blue is the primary colour of choice, as it has been for a while now, and combined with black it reflects the colours of the St Helens heritage jersey they first wore in 2010, which was itself designed to emulate the hoops of the 1890 kit. There’s no hoops here of course – instead we have the more common chevron on the jersey’s front, and heavy use of the cross-hatch pattern that we saw on the home shirt. 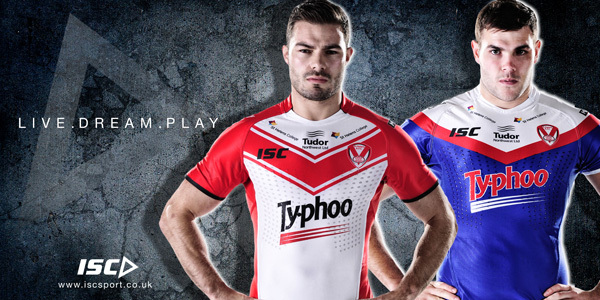 It’s used to much more overt effect here though, making the jersey look unmistakably modern. The hatching pattern around the chest and shoulders gives the jersey a bit of a 90s video game effect – like the sort of thing a TV show would use to represent a ‘video game character’ in suitably embarrassing fashion… but we think it looks really cool. It’s hard to argue with either of these designs – one does a fabulous job of melding the traditional and modern to create a shirt that will please old and new fans alike, while the other is unabashedly modern, but without looking tacky or too busy. O’Neills’ presence in rugby league is gradually increasing, and on this evidence, that can only be a good thing.